San Gregorio is on the Straits of Magellan, north-east of Punta Arenas and on the road to Rio Gallegos. Two short metre gauge lines ran here, one within the estancia, and the other connecting the 1908 frigorifico to the muelle at Puerto Sara. The estancia (a part of the Menéndez empire) covered 220,000 acres or 360 square miles so having a railway was not the luxury it might seem! 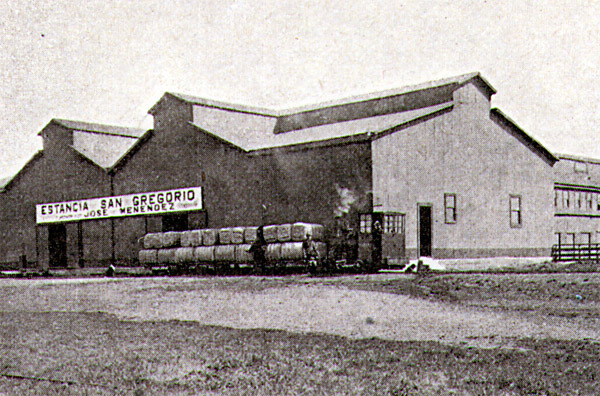 The estate was re-equipped in 1903 and a metre gauge railway constructed from the main shearing shed (el galpon de escuila) the two kilometres or so to the estancia's own muelle. The photos above and below show a locomotive (probably Hanomag no. 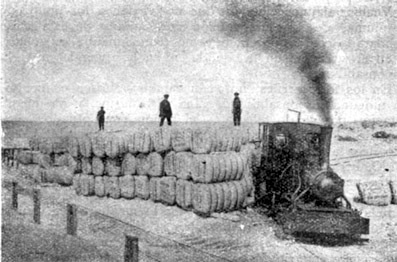 4567 illustrated further down) with the bales of wool which were the main cargo from the estancia to the port. The one above was taken at the estancia outside the woolstore which still exists, though nowadays facing the main Ruta Nacional. The picture below was kindly provided by Carlos Vairo of Ushuaia Maritime Museum. The line was largely operated by steam: Hanomag 0-4-0WT no. 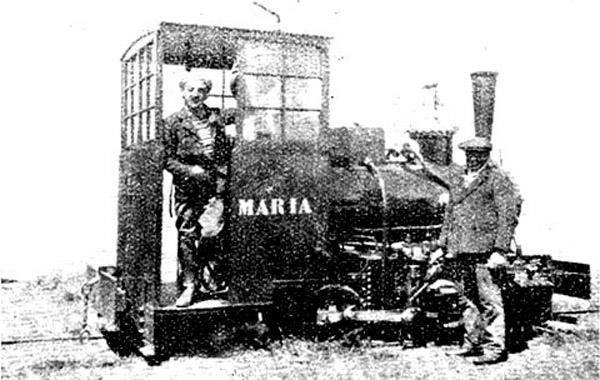 4567 of 1910, named 'Maria' after doña Maria Behety, the wife of José Menendez the owner of the estancia. 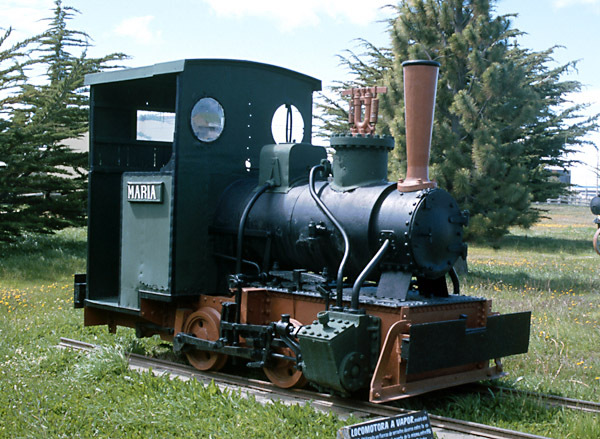 The loco gained a replacement boiler in 1926 and worked probably until around 1944 or 45., though Wilfred Simms (1) suggests that steam was out of use by 1940 In 1973 it was rescued and put on static display at the Instituto de la Patagonia in Punta Arenas. A poor quality photo but one which clearly shows the loco's name on the cabside and the unusual cab with multiple panes of glass (2). Hanomag no. 4567, 'Maria', now at the Museo del Recuerdo. This loco was reboilered with a new Jung boiler in 1926. After the disuse of the steam loco, a diesel was purchased:a Drewry 0-4-0D (Drewry no. 2203 of 1944, but actually constructed by Baguley, their works no. 2206). It seems likely that this worked until the railway fell into disuse perhaps around 1950 (3). 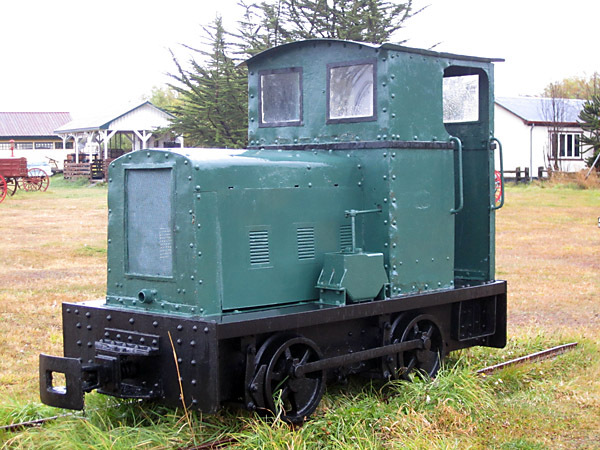 Below is seen the Drewry diesel, which for many years was a plaything in the Parco Maria Behety in Punta Arenas, though recently removed to the Museo del Recuerdo open-air museum. The bonnet sides are new and do not necessarily match the originals. This second line in the area was in fact ten or twelve kilometres away to the south-west, where in 1908 a big meat freezing plant had been built adjacent to a muelle known as Puerto Sara. The frigorifico was built by the Cia. Frigorífica de la Patagonia (Townsend). It had a 'main-line' of 500 m of double track from the cold stores to the muelle, and possibly around 1000m more of sidings. A photo discovered by Señor Martinic for his 2005 paper () shows the O&K together with a train of carcases en route for the muelle. This line was also of metre gauge and possessed an Orenstein & Koppel-built 0-4-0T (of 1906? possibly no. 4975; or from 1912, no. 5824?). 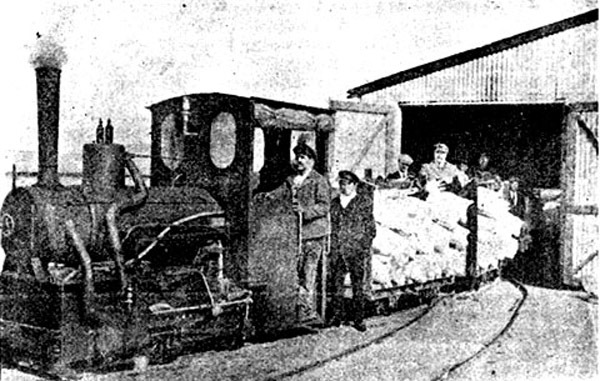 The wagons appear to have been four-wheeled plataformas with high ends to support the stacked carcases. 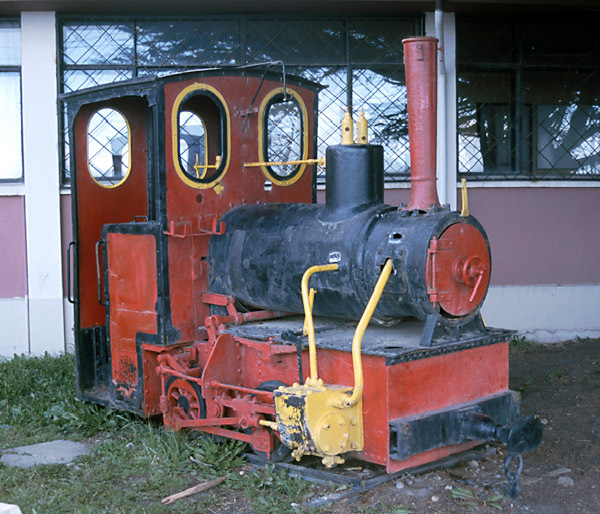 The railway seems to have worked until about 1953, and the loco is now preserved outside the Esquela Industrial, in Punta Arenas. It is illustrated below in a modern photo taken in December 2000. The frigorífico's German 0-4-0T, an O & K (no. 4975?) outside the Escuela Technical. One source (4) suggests that this loco in fact ran on the FC Mina Loreto rather than at this location. 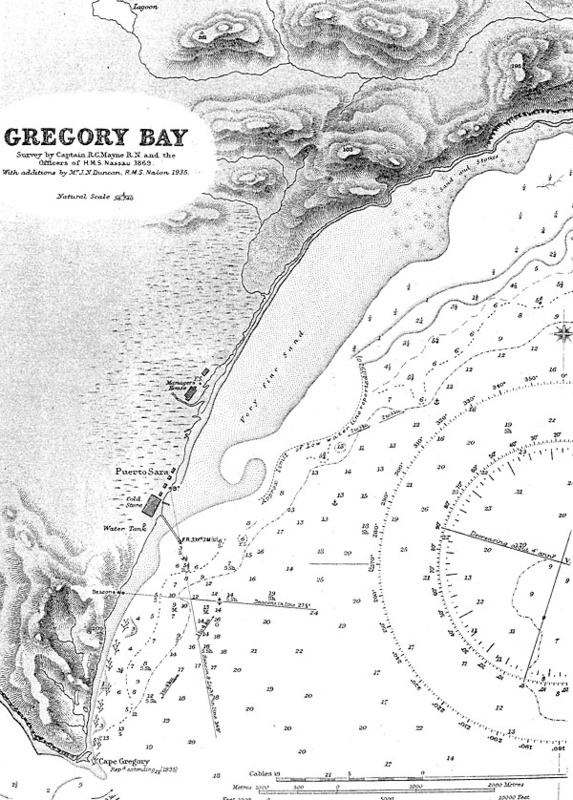 The British Admiralty chart of 1935, below, shows a cold store and pier at Puerto Sara, but it is likely that shore features had only been updated erratically since the chart was first drawn in 1869 (5). There was a standard gauge steam crane (Grafton Cranes of Bedford, UK. Works no. 1003 of 1906) on the muelle at Puerto Sara. This was later preserved at the Instituto de la Patagonia in Punta Arenas, though without the box like cabin that it was probably built with. 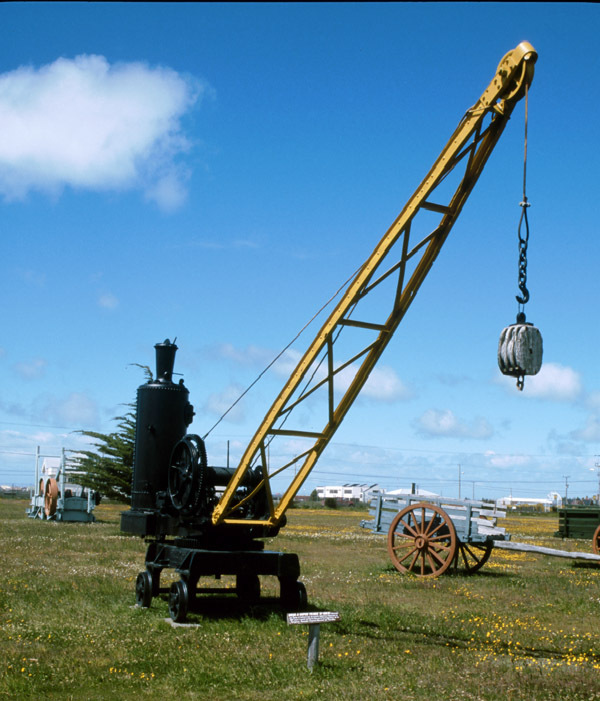 The Puerto Sara crane is pictured at the Instituto de la Patagonia in 2001. No photos have been found showing the frigorifico at Puerto Sara, however, an aerial shot of an unknown frigorifico is shown in the Overview page of this chapter. This was from a Chilean source and might be of this location. The estancia incidentally, was divided up in the early 1970s under the Allende government's reforms. Most of the estancia buildings survive, either side of the main road, but the frigorifico site is now part of the Puerto Sara oil terminal and it is unlikely that much survives from the railways. 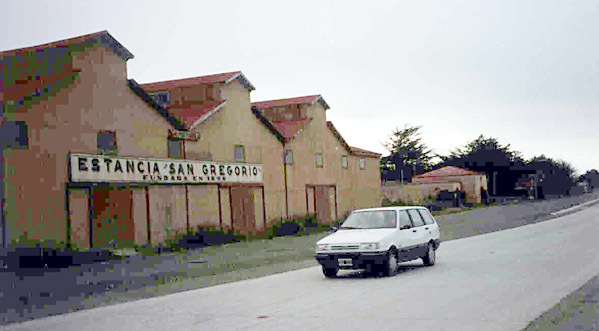 A 1997 shot of the estancia's woolstore, courtesy of Raúl Moroni. Compare this with the photo at the top of the page. 1 The Railways of Chile, Volume 5 - Southern Chile. 2002. Wilfred Simms. Page 63. 2 Photo found by Señor Mateo Martinic for his Ferrocarriles en el Zona austral de Chile 1869-1973. 2005. Instituto de Historia, Pontifica Universidad de Chile, Santiago. Available on the web. 5 Chart found in the British Library map collection.